Pope isn’t just settling on selection for England! England goalkeepers Jordan Pickford (left), Nick Pope (centre) and Jack Butland during the training session at St George's Park, Burton. PRESS ASSOCIATION Photo. Picture date: Tuesday March 20, 2018. See PA story SOCCER England. Photo credit should read: Mike Egerton/PA Wire. RESTRICTIONS: Use subject to FA restrictions. Editorial use only. Commercial use only with prior written consent of the FA. No editing except cropping. England goalkeeper Nick Pope isn’t prepared to settle for second or third best now that he’s been named in Gareth Southgate’s 23-man World Cup squad. Burnley’s Player of the Year, who joined up with the Three Lions at St George’s Park at the beginning of the week, is hoping to mark the most memorable season of his career with his first international cap. Pope, who is working alongside goalkeeping coach Martyn Margetson, will be challenging Jordan Pickford and Jack Butland for the honour and will have a minimum of five games, and a maximum of nine, to achieve his ambition over the forthcoming schedule. England will take in friendlies against Nigeria, at Wembley, and Costa Rica, at Elland Road, next month in preparation for the tournament in Russia where group games against Tunisia, Panama and Belgium could potentially be followed by four knockout ties. “It’s obviously special to be here at this time,” he said. “They are exciting times in the lead up to a World Cup, it’s not like every other camp. It’s the biggest tournament in the world. “There was massive excitement, pride and honour. It was a sense of achievement - out of all the English players across the world I was going to be part of the 23 that would represent the nation at the World Cup. “If you could be in any squad you’d want to be in this one. In any person’s career the maximum amount of World Cups you can do is three, possibly four if you’re really lucky and start really young. Asked if he was ready to serve his country, Pope added: “Of course. That’s the plan for me and that’s my goal at the minute. “When you get in an England squad the next goal is to get a cap. That’s something that you dream of doing as a little boy. “As an England fan you watch every game growing up, when a World Cup is on or the Euros everyone is watching. 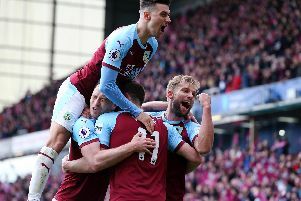 Pope, along with Icelandic winger Johann Berg Gudmundsson, will be the first Burnley player to go to a World Cup Finals since the Northern Ireland pair of Billy Hamilton and Tommy Cassidy in 1982. Should he feature, the former Charlton Athletic stopper would become only the second representative from Turf Moor to have appeared for England at this stage of the competition. The last player was also a goalkeeper, with Colin McDonald playing in all four games in the 1958 World Cup in Sweden. McDonald featured against the Soviet Union twice, with the second a play-off game, Brazil and Austria. And you certainly wouldn’t put it past the 26-year-old. The former milkman has continuously raised the bar as a professional, making the number one spot at the Valley his own after loan spells with Cambridge United, Aldershot, York City and Bury. When he signed by Sean Dyche in the summer of 2016, Pope was third in the pecking order behind Tom Heaton and Paul Robinson. The Soham-born keeper, who was called up for the first time in March for the friendlies with Holland and Italy, made his Premier League debut in September after Heaton suffered a dislocated shoulder against Crystal Palace and went on to keep 12 clean sheets. “It’s something that you can never picture happening,” said the one-time Ipswich Town season ticket holder. “You’ve just got to take it a level at a time. “I managed to get back in to the professional game at Charlton and then went straight back out on loan to the level where I’d come from. He added: “This time last year, going in to the summer, I’d never played in a Premier League game. Getting in to the England squad wasn’t even in my mind. “It’s been a quick turnaround since September when I played my first Premier League game so to be here now is something I could never have pictured then. Heaton and centre back James Tarkowski, who made his bow in the 1-1 draw with the Azzurri at the home of English football, are among five players on the standby list, with Lewis Cook, Jake Livermore and Adam Lallana also included. And Pope is pleased to have some familiar faces around him. He said: “It will be nice to have a familiar face for myself when Tom comes to be part of the goalie group. “He’s a great character to have around in any environment so myself and the other keepers are looking forward to having him here. “It’s been great; they’re two lads (Jordan Pickford and Jack Butland) that I really get on with and we’ve got Angus (Gunn) here with us at the minute as well. “He’s another great person to have around. We’ve got a great group amongst ourselves and we’re pushing each other every day. “If you look back at the standby list over the years there’s normally one player that makes it or, if not, sometimes two or three. England’s recent competitive record doesn’t make for very good reading. They reached the round of 16 at the World Cup in South Africa and failed to progress from the group stages at the following tournament in Brazil. At the European Championships in France two years ago they failed to make the quarter-finals once again, beaten 2-1 by Iceland in Nice. However, Pope is determined to address that and leave a legacy that will inspire generations to come. “There’s a lot of excitement in the building and you feel that among the squad,” he said. “We’ve had meetings about what we want to achieve, about how we feel and what we think about what could happen at this World Cup. “I think the biggest thing to come out of it is what an opportunity it could be for this squad to make ourselves and the country proud and put down a marker or a legacy that will live on in the future. We want to set a target for future generations. “I’ve just got to be incredibly happy, I’ve just had the best year of my career. I’ve got into a European spot with Burnley, something that I could never have pictured myself doing.